A Canadian business technology interest group launched a subscription-based, on-demand video service via the Web on Monday. Ottawa-based non-profit CATA Alliance is the largest hi-tech membership association in Canada. It’s new video serviced dubbed CATAnet TV On-Demand Service has hit the Web, offering one channel and four videos, with more channels and content on the way soon. The on-demand Web video is part of CATA re-vamping its services to take advantage of Web 2.0 technologies, says CATA CEO John Reid. He equates the offering to an on-demand specialty TV channel. CATA is tapping the software-as-a-service offering of Calgary-based JITR Inc. Its JET system lets any company or organization deliver live, high-definition video to a large and controlled audience. Other JITR customers include life-insurance company Primerica Financial Services. The company’s CEO uses the service to broadcast a video into 5,000 offices each week to provide leadership direction and best practices advice. “We’ve built a platform that delivers video or rich media services via the Web for business to business communications,” says Robert Hohol, executive vice president at JITR. He said the firm’s focus is to enable compelling content — such as that provided by subject matter experts — to be accessed by a broad-based clientele. The video can be delivered live or on-demand, he adds. It can also be primed for consumption on mobile phones or for download on iPods and other gadgets. Canadian consumers do have a growing appetite for streaming online video, according to Tony Olvet, vice-president of Canadian communications segments at IDC Canada in Toronto. The consultant firm’s research points to a growth in streaming video, while downloaded video declines. So there’s reason to believe it can work in a business-to-business scenario too. But to meet success in the business world, a couple of points must be hit. CATA’s first offering in this area is called the Scientific Research and Experimental Development (SR&ED) channel. 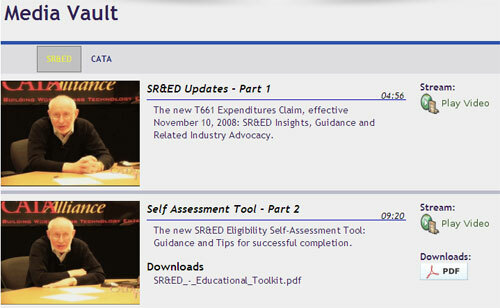 It features tax advice offered by Host Russ Roberts, senior vice-president at CATA. There are currently four videos available – two offered as a free preview and two for subscribers to the channel. Prices for a year’s subscription to a particular channel is $45 for non-members and $25 for existing members. New channels will be coming out in the future for different subject areas such as health care, Web 2.0, government relations and CEO leadership. A channel focused on advanced security is expected soon, Reid says. Charging for the video service could be a hindrance considering there is much free video, and ad-supported video, available on the Web, Olvet says. CATA has had success charging for well-targeted content in the past, Reid says. The association regularly sells conference call spots to its members, promising a discussion with an important player in the industry. He says the subscription fee isn’t high. While as of now, only a dozen or so subscribers have signed on, Reid expects the service to grow in popularity. Subscribers to the channels will also have access to white papers and other documentation on the subject matters. They can expect the channels to be updated with new content each quarter, or as necessary when new laws or regulations need to be highlighted, Reid says. The video is streamed in Flash format and is compatible with most browsers. CATA is considering mobile accessible content as well.